The Fractal Sunflower design was inspired by my the gardens my Mother planted when I was a child and by the Texas sized sunflowers that grew in our area. As an adult, I carry this love of flowers and plants with me. So, it is natural that I would include floral inspired designs in my digital art — with a splash of vivid color! 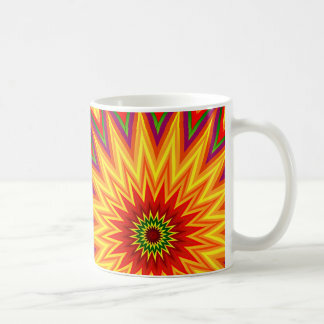 This design, currently on our Zazzle storefront, features the bright yet deep hues of a summer field, ranging from golden yellow, red, auburn, deep purple and green. One of my favorite designs, I have included it on numerous products, including poster prints, pillows, luggage tags, magnets, leggings, and more! I recently purchased a small poster print of this design, and the print job was out of this world! I would definitely recommend this poster if you want to brighten up a room. It comes in multiple sizes and paper types, as well as framing options. Cynthia Manor is a Digital Artist, Poet, IT Professional, and Web/Graphic Design Student living in Austin, Texas. She is the creator of Colors of Africa Art & Design as well as Anointed Design.